Electronic Pinball Games Repair Procedures #FO-560-3 (October, 1981). WOW! 92 pages! Electronic pinball repair manual used by shop technicians. 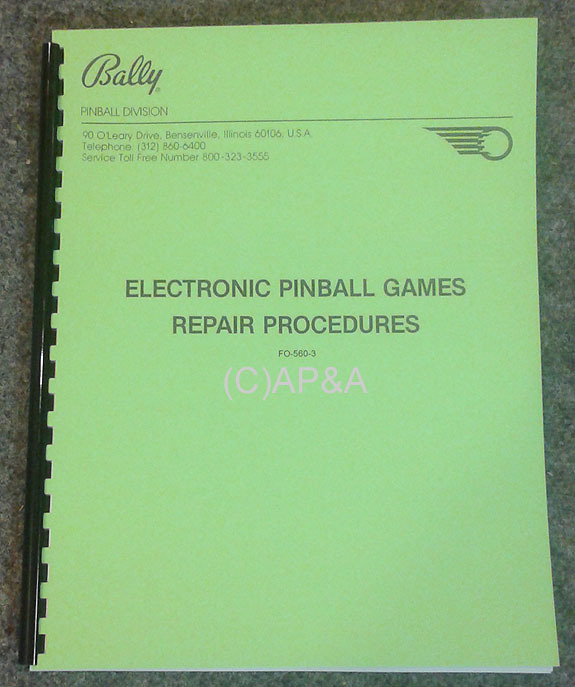 This manual covers most circuit boards and diagnostic procedures for 1977-1985 Bally electronic pinball games. Updated version with some additional, newer information from the previous edition, for the newer games. Also contains information on the Squawk & Talk sound/speech board, including theory of operation and diagnostic repair procedures. Use this manual if your game has sounds and speech (most games 1980-1985). Reprint manual, new condition.